Stylists spend a great deal of time explaining to guests the many and varied stages of hair color. 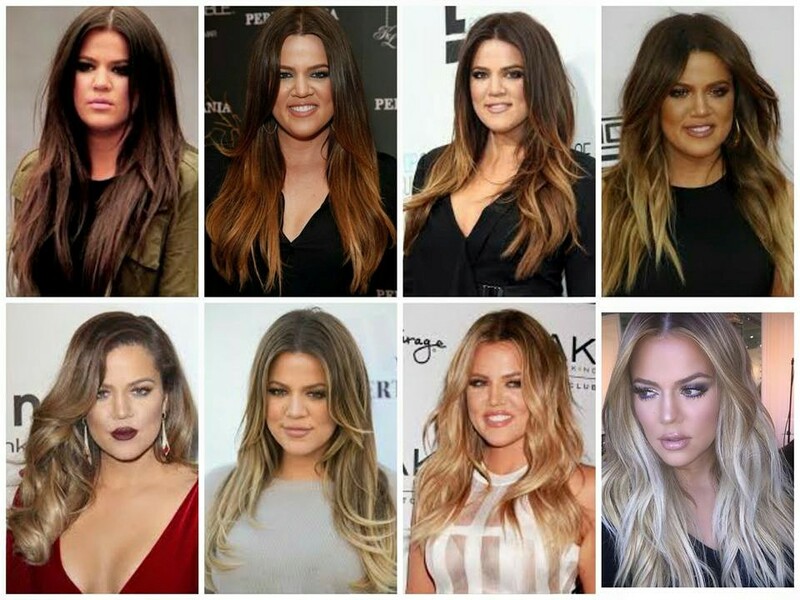 Instagram stylist Danielle Filice @vixenhair uses Khloe Kardashian as the prime example of undergoing a significant transition in hair color over the past two years. Understanding color theory is the best way to know what to expect during each step of the process. We all have different undertones in our hair. If you have black, dark brown, or medium brown hair, your undertone is red. If you have light brown, dark blonde, medium blonde, your undertone is orange. If you have light blonde to pale blonde, your undertone is yellow. What this means at the salon. If we lighten your hair, your natural undertone is going to show through the color we achieve. 1. We can bleach or lighten you to the palest color we can achieve – sometimes that may not be as light as you are hoping. adding Olaplex to your service can greatly increase the chance of getting your hair lighter, without the expected damage. 2. We can tone your hair with green to cancel red, blue to cancel orange, and violet to cancel yellow. Sometimes this makes the hair muddy looking, or a little tinged to a blue, green, or violet color. Note: toner only lasts 4-6 weeks, so keep coming back. 3. We can balance your hair with a pH treatment. 4. We can seal in your color with a treatment to help reduce fading and keep your color long lasting and vibrant. What you need to do for yourself. 1. Throw out your cheap products. They contain harsh chemicals that eat away at the molecules in your color. 2. Stay out of the sun. The Sun naturally lightens hair. When your hair lightens, the natural undertones begin to pop out. 3. Invest in a water softener. Hard water puts unwanted chemicals in your hair and can strip the color. 4. Don’t try toning at home. Drug store and beauty supply stores do not offer quality products. 5. Buy a take-home treatment. Davines and Aveda offer lines formulated to keep your color lasting longer and improve the overall health of your hair. 6. Be patient. Color takes time, or you will end up with damaged hair. Remember, a color transition is an investment that requires patience and great conditioner. Your desired look could take multiple applications. Schedule a color consultation with our stylists. We can work out a battle plan together.